Adverse weather conditions are typically associated with the winter months. Peak summer temperatures also see our cars subjected to stress due to excessive heat. Driving in hot weather can of course lead to a very hot cabin. Excessive heat can lead to dehydration and heat exhaustion. Some cars come fitted with air conditioning that will enable a much cooler climate. Air con does come with a price though, and this is increased fuel usage. If fuel usage is an issue, whilst driving at slower speeds of 30mph and under, turn off the air con and open the windows. Higher speeds will see wind resistance reduced by having the windows open and in turn use more fuel. At speeds of over 30mph, close the windows and switch on the air con. Take along a bottle of water to keep hydrated. If tiredness is an issue, a caffeinated drink may prove beneficial. Now that the driver is kept in good health whilst driving in hot weather, to aid in avoiding breakdowns, it’s important we also look after our car. Let’s take a look at a few tips on keeping your vehicle in optimal condition for hot weather driving conditions. Cars are of course designed to operate in high temperatures. Unreliability and breakdowns may occur if your vehicle is not properly maintained. Basic car maintenance usually takes only a few minutes and should ideally be completed on a weekly basis during peak hot or cold temperatures. Engine coolant circulates throughout the engine keeping it cool. The cooling system is sealed and an engine that is running at its optimal should rarely need coolant levels replenishing. Leaks can occur and frequent coolant level checks should be made. 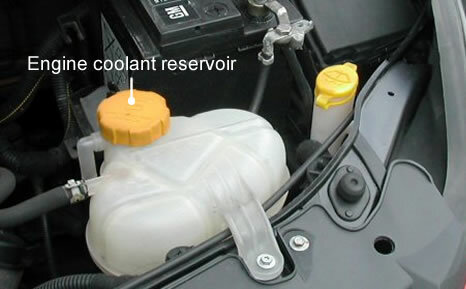 Under the bonnet, coolant fluid can be topped up in the header tank. A minimum / maximum mark should be displayed on the tank. Its advisable to keep a bottle of water in the boot of your vehicle should you need to replenish coolant levels whilst on the road. You may also want to consider replenishing antifreeze levels during hot weather. Antifreeze does of course prevent coolant from freezing during cold temperatures, however, the properties of antifreeze also raise the boiling point of the engine coolant allowing an engine to run hotter without overheating. Antifreeze is usually added to to water on a 50/50 basis, or a premixed solution may also be purchased. If you notice your temperature gauge is displaying a hotter engine than normal or a warning light is displayed due to high engine temperatures, stop the car as soon as it’s safe to do so and turn off the engine. If you notice steam coming from your engine, this indicates the coolant has started to boil. High levels of engine damage may occur. Pull over and turn off the engine immediately. Leave the car for 20 – 30 minutes or so to cool down and check engine coolant levels. Remove the cap to the header tank slowly and ideally with a cloth as the tank is pressurized and hot gasses can emit violently if opened abruptly or if not given sufficient time to cool. If coolant levels are low, replenish up to the safe levels. Keep check on levels frequently in case of leak in system. If coolant does not need replenishing, this suggests a fault in the cooling system. In this situation, it is not advised to drive your car and to seek assistance from a garage / breakdown service. Engine oil lubricates the moving components inside the engine. As engine oil levels become low, friction on moving metal components increases and so will heat. Keeping engine oil at optimum working levels keeps the engine efficient and also helps to cool it – especially important in hot weather. 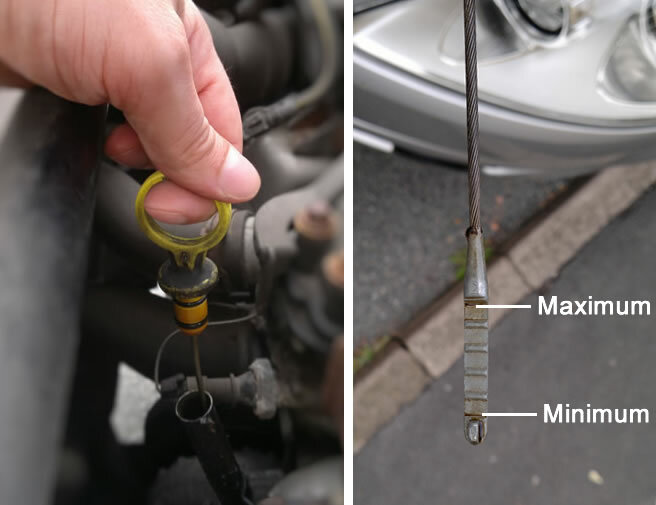 Oil level can easily be checked by using the dipstick. The dipstick is a brightly coloured loop or handle. ensure your vehicle has not been running for 10 minutes or so and is parking on a reasonably flat surface. Remove the dipstick and clean the end using a cloth. Reinsert the dipstick and once again remove. Check between the minimum and maximum level markers where the oil level is and if too low, replenish oil.